Cucumber in a Fruit Smoothie?! I got this idea while I was making tzatziki sauce (which you will read about in another post this week), I realized it would be wasteful for me to get rid of the cucumber juice that you squeeze out of the cucumber! Why not put it in this delicious smoothie? These are all approximate measurements, so feel free to play with the measurements. After all, it’s a smoothie! What can go wrong? 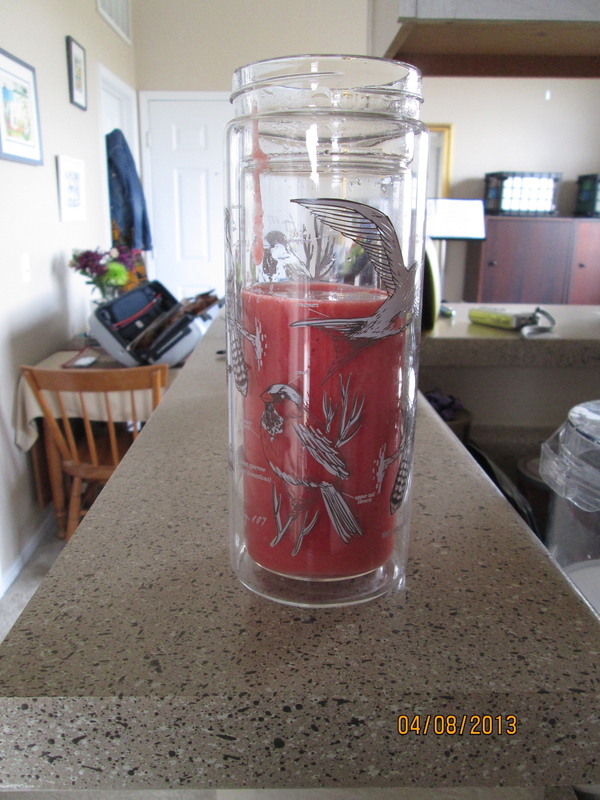 Throw it all in the Vitamix (or other blender…I LOVE my Vitamix) and go crazy! I loved the cucumber in it so much, I think I will add more next time. Also, since this smoothie was a snack for me, I didn’t make a very large one. Next time, I’ll definitely make more. You could also add flax seed or soy protein to make it into a meal. Because of the cucumber juice and fresh strawberries, I didn’t need to add any liquid. If you choose to use frozen strawberries, you will need to add some water in order to make it drinkable. I think this smoothie will be perfect with the upcoming warm days (unfortunately it’s snowing here today). The cucumber is so cool and with the ginger it’s amazingly refreshing. I put it in my double wall glass tea thermos and left for work. Mmmmmm! I’ll have to give this a try! I like ginger in my smoothies. It gives a great fresh taste!